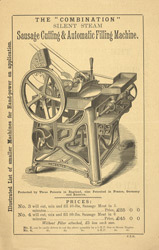 This advertisement for Thomas Williams’ Sausage Cutting and Automatic Filling Machine features a detailed illustration of the machine itself. Sausages were first eaten as early as 500BC, when it was discovered that scraps of meat could be cooked in casings made from the intestines of animals. The word sausage derives from the Latin 'salsus', meaning salted, or preserved meat. Sausages were found in almost every region by the Middle Ages and many different varieties were developed, according to local environments and livestock. The technological revolution of the 19th century contributed to the popularity of the sausage. Machines such as Williams' made the manufacturing process easier and faster.